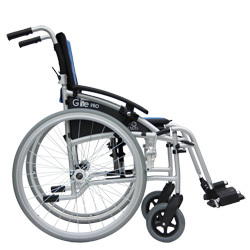 This G-Lite Pro Wheelchair has a sleek, modern look and uses a lightweight aluminium frame to keep weight down to around 9kg. It has all the features you'd expect from a technologically advanced wheelchair too, from quick-release wheels to height-adjustable armrests. It's intended as a lightweight, low-maintenance solution for those who need an occasional wheelchair, so as you might expect it's easy to fold and compact to store. 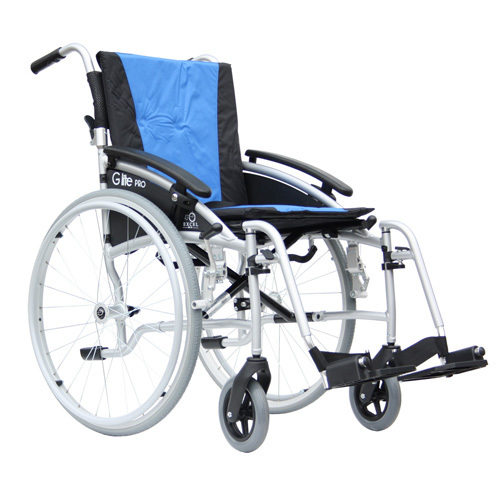 G-Lite Pro wheelchairs are available in attendant or self-propel styles, and in three seat widths. The Rear wheels are fitted with Quick release pins, which means they can be removed in second making the Chair extremely easy to transport. It still has the half folding backrest and swing away removable footrests which all contribute to is very small transport size and weight. Another addition to the G Lite Pro is the introduction of height adjustable armrests, which are not only great in helping to make the user as comfortable as possible, but due to the way they fold, it makes the chair perfect for whilst at a desk or table. Lovely wheelchair, comfortable and easy to propel . Very happy with my purchase and quick delivery .